Does the world need a Supergirl? With the Daily Planet labeling her a super-tart, and her Kryptonian mother questioning her allegiance, Supergirl is lost, confused and angry. Enter Superwoman. At first, the mysterious super-heroine appears a sympathetic friend to the beleaguered Kara. But when Supergirl is tasked with capturing Reactron - a gold Kryptonite-wielding psychopath - it's clear that Superwoman may not be the ally Supergirl believed. But Supergirl's not only contending with Superwoman; she's also struggling to choose sides for the battle Kara's long-lost Kryptonian parents are waging on Earth. Torn between the people of their adopted home and the survivors of the world they lost, Superman and Supergirl must choose sides... but what happens if they choose differently? 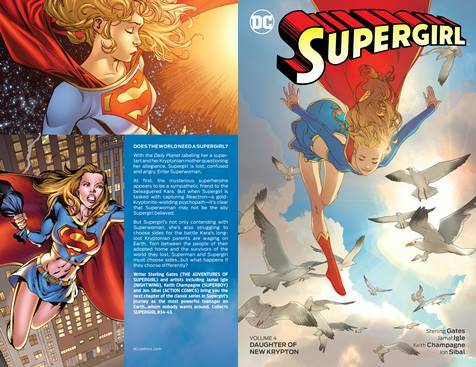 Writer Sterling Gates (THE ADVENTURES OF SUPERGIRL), accompanied by artists including Jamal Igle (NIGHTWING), Keith Champagne (SUPERBOY) and Jon Sibal (ACTION COMICS) bring you the next chapter of the classic series in Supergirl's journey as the most powerful teenager on Earth... that nobody wants around. Collects SUPERGIRL (2005-2011) #34-43.